After posting the whiniest blog ever, I retreated to the shower while Lonny was still out with the kids at a birthday party. I turned off the lights, set the water on hot and got in. Fortunately the dog is scared of tile and James ignores us when we’re acting weird, but the situation was so funny that I had no choice but to snap out of my funk. This is totally how my family rolls, we have to be on top of each other. We must. It put me in a much better mood for the night. After dinner we piled on the couch, lit a fire and watched a movie together in an overheated room. Rules of movie watching in my house are: you talk, you get a pinch. 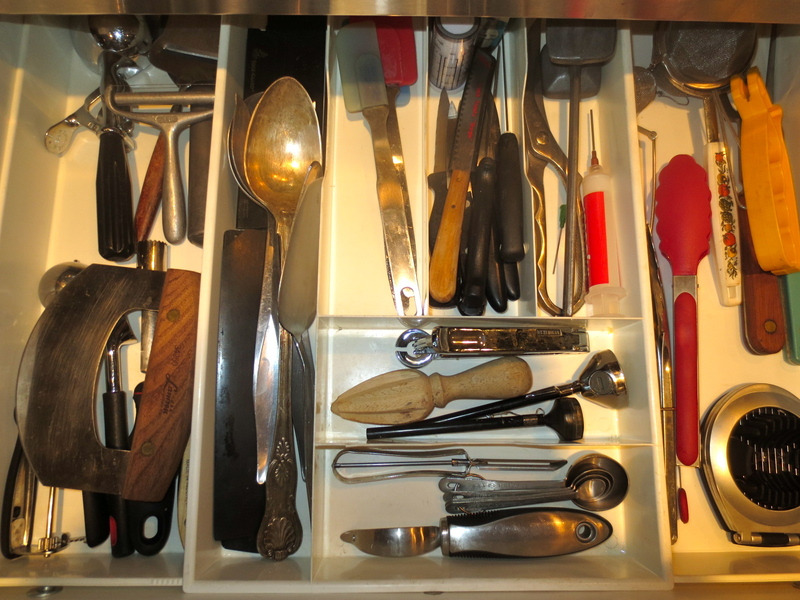 This has been bothering me forever, my utensils drawer. I contemplated taking a before picture but I figured I’d preserve what was left of any respect my 12 followers have for me. Hi Dad! Hi Greg! My friend Sara talks a lot about how much she cleans her house. I can only imagine the shining temple to cleanliness her kitchen is, not that I’ve ever been in her house, so much that I actually get nervous when she comes over. At parties I try to steer her away from this drawer because I know she’ll recoil in horror and might even spit on the floor in disgust if she peers inside the heart of darkness. Above are the items that I have removed. What, you say? 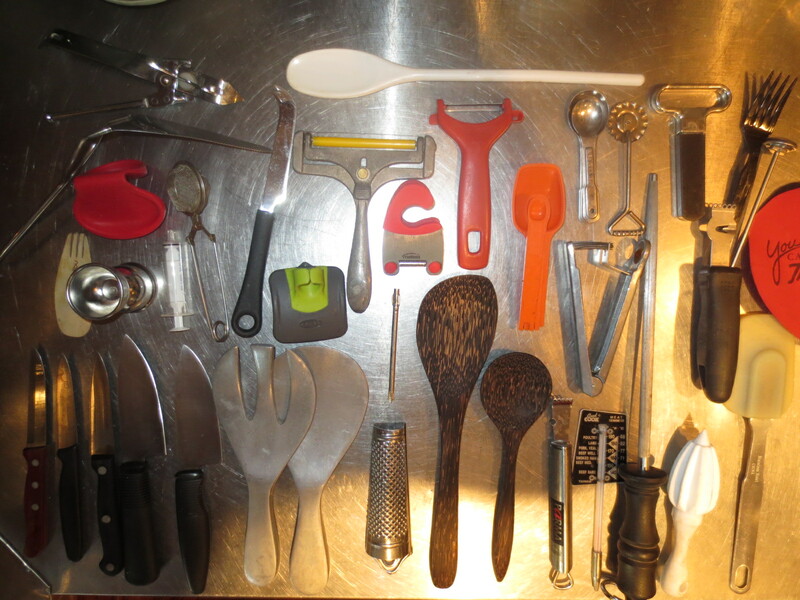 Don’t I need those paring knives, cheese slicer, cherry pitter, salad tongs, citrus reamer, tea infuser, sharpening steel, spatulas, vegetable peeler, can opener and measuring spoons? Fear not gentle reader, those are simply multiples. The Nambe tongs are going to my sister-in-law but the rest are UP FOR GRABS. The other ten items (not pictured) are ten more files from my cabinet that I am going to scan and toss today. After! Ahhhh. I am not a loser. I do not wallow in my own filth. I am a good person. This entry was posted in Husband, Kids, Neurosis, Project3650, Un-Parenting, Uncategorized and tagged kids in bathroom, kitchen drawer, kitchen gear, lack of privacy, Project3650, purging. Bookmark the permalink.